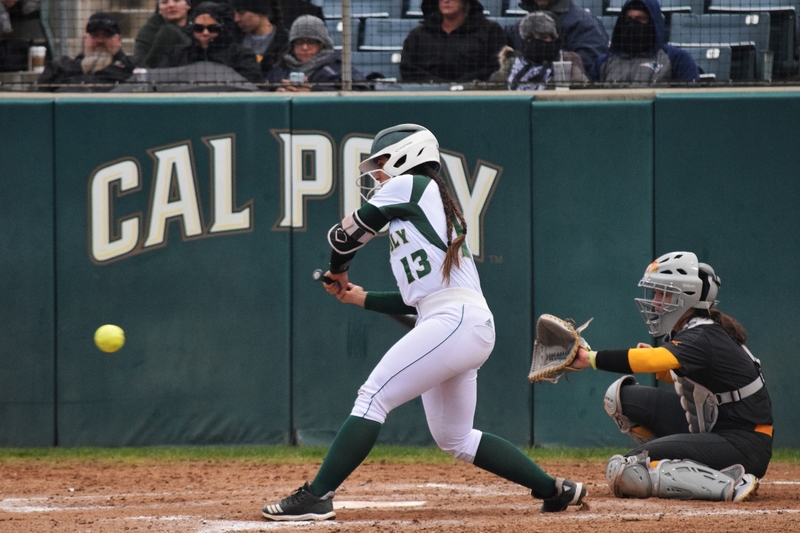 On March 30-31, Cal Poly Softball opened their Big West Conference play with a three-game series at UC Riverside. The series snapped UC Riverside’s 13-game win streak and saw three Cal Poly players register their first career home runs. However, with a loss on Saturday and Sunday, the Mustangs’ overall record fell to 7-26 for the season. On Saturday, March 30, Cal Poly (7-26, 1-2 Big West) opened the series with a 4-1 victory over UC Riverside (19-13, 2-1 Big West). The win was propelled by home runs from senior third baseman Noa Yakir and freshman designated player Lily Amos. The Mustangs scored early in the first inning after Yakir registered her first career home run over the left field wall. However, in the bottom of the same inning, UC Riverside’s Emma Ramelot responded with a home run of her own to tie the game at 1-1. Cal Poly continued to convert their chances at bat, requiring almost no time to recover the lead. In the top of the second inning, Lily Amos doubled to center field before advancing to third on a wild pitch. Freshman shortstop Maddie Amos followed with a RBI single to right center field to drive her sister home for the 2-1 lead. The Mustangs extended their lead again in the top of the fourth inning with four hits and two runs. Junior first baseman Hailey Martin singled down the left field line before Lily Amos registered her first career home run for a 4-1 Mustang lead. Senior outfielder Sydney James and sophomore infielder Hannah Ramelot each totaled a hit following the scoring drive, but UC Riverside captured the third out with two runners left on base. The Highlanders were held to only one hit in the final four innings as Cal Poly captured the win. UC Riverside pitcher Jacy Boles (10-3) was straddled with the loss after allowing seven hits and four runs through four innings. Cal Poly sophomore righthander Dakota Casper capped her performance by retiring the final 11 batters in Saturday’s game. Casper (1-3) was granted the win with three strikeouts and one walk. In Saturday’s second match against the Highlanders, the Mustangs fell 3-2 despite a nearly successful late-game comeback attempt. The first two innings saw only one hit before the Highlanders’ offense took control in the bottom of the third. After UC Riverside’s Nadia Witt singled to first and stole second, Danielle Ortega grounded a hit towards Mustang pitcher Steffi Best. Best’s putout attempt was too high for Martin at first base and Witt took advantage by crossing home plate. Ortega later scored after an unsuccessful pickoff attempt at third base. Melanie Olmos capped UC Riverside’s scoring drive with a sacrifice fly to drive in Brittney Garcia, who was in scoring position after stealing second on a Cal Poly error. Three UC Riverside hits combined with three errors from the Mustangs resulted in a 3-0 lead for the Highlanders. In the top of the fourth, the Highlanders captured two outs before Martin reached first base on a walk. Senior right fielder Crimson Kaiser followed with a single through left field. However, both runners were left on base after UC Riverside concluded the inning with a fly out at third. In the top of the seventh, the Mustangs threatened a comeback by scoring the final two runs of the game. Kaiser reached first base on a walk before Maddie Amos’ grounder forced an error by UC Riverside at third base. Junior pinch hitter Shelby Jeffries followed up with a 2 RBI double to right center field to cut the deficit to 3-2. At that point, Boles entered the game or UC Riverside and retired the final two batters, concluding the match at 3-2. Best (2-17) was given the loss after allowing six hits and three runs. Highlander pitcher Melanie Olmos (1-0), who allowed four hits through six innings, captured the win. Cal Poly was held to just two hits on their way to a 3-1 defeat in Sunday’s series finale. Senior Kirra Loucks registered her first career home run for the Mustangs, but the lone run was not enough to overcome the Highlanders’ seven-hit performance. In the top of the first inning, UC Riverside turned a double play before senior catcher Makenna Young was retired as the final out. In the bottom of the same inning, the Highlanders loaded the bases with two singles and a walk. However, the final two batters grounded out to end the inning 0-0. All three of UC Riverside’s runs came in the bottom of the third inning with four hits and two Mustang errors. After the Highlanders loaded the bases with two singles and a walk, Olmos singled to left field for a 1-0 lead. Garcia also scored on the sequence as a result of a Cal Poly fielding error. UC Riverside’s Amanda Lynch finished the 3-0 scoring drive with an RBI sacrifice fly to bring home Garcia. The Mustangs’ first hit came in the top of the fourth inning when Kaiser registered a single to shortstop. However, Cal Poly did not get on the board until Loucks’ homer in the next inning. The Mustangs had another chance to score in the sixth inning, but runners were left on second and third after Boles forced a fly out from Jeffries. The Highlanders only registered one hit after their three-run scoring drive. Casper (1-4) was given the loss after allowing six hits and three runs through three innings. Best allowed just one hit in her three innings as a reliever. Megan Casper (5-2), who allowed zero hits through three innings, captured the win for the Highlanders. Cal Poly will host Hawai’i (21-10, 2-1) for a three game series starting Friday, April 5 at 5 p.m. inside Bob Janssen Field.